What is Capacitors ? How dose it work ? How many Type ? Take two electrical conductors (things that let electricity flow through them) and separate them with an insulator (a material that doesn't let electricity flow very well) and you make a capacitor: something that can store electrical energy. Adding electrical energy to a capacitor is called charging; releasing the energy from a capacitor is known as discharging. A capacitor is a bit like a battery, but it has a different job to do. A battery uses chemicals to store electrical energy and release it very slowly through a circuit; sometimes (in the case of a quartz watch) it can take several years. A capacitor generally releases its energy much more rapidly—often in seconds or less. If you're taking a flash photograph, for example, you need your camera to produce a huge burst of light in a fraction of a second. A capacitor attached to the flash gun charges up for a few seconds using energy from your camera's batteries. (It takes time to charge a capacitor and that's why you typically have to wait a little while.) Once the capacitor is fully charged, it can release all that energy in an instant through the xenon flash bulb. Zap! 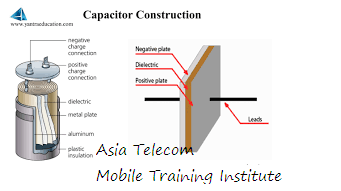 There are mainly two concepts for defining capacitance. The electrical concept is given below. Capacitance is said to be the capacitor’s storage potential. 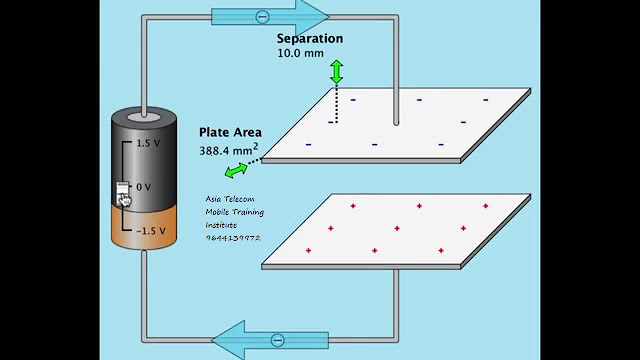 In other words, for an existing potential difference or voltage “V” across the plates, the capacitance is said to be the amount of charge “Q” stored in between the plates. The capacitance of a capacitor is measured in units called Farads. A capacitor is said to have 1 Farad of capacitance when the capacitor can hold 1 amp-second of electrons at 1 volt at a rate of electron flow of 1 coulomb of electrons per second. As 1 Farad is a big value, the capacitors are usually denoted in micro farads. A Capacitor that is connected to a battery is shown below. 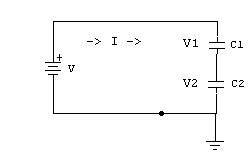 dq = C*dV, where dQ is the small change in charge and dV is the small change in voltage. When the capacitor is fully charged it will have the same voltage as the battery. Capacitors C1 and C2 connected in series are shown in the figure below. When the capacitors have a series connection the total voltage “V” from the battery is split into V1 and V2 across the capacitors C1 and C2. 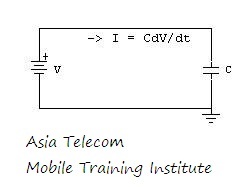 The overall charge “Q” will be the charge of the total capacitance. C1 = Q1/V and C2 = Q2/V. Since the capacitor can discharge in a fraction of a second, it has a very large advantage. Capacitors are used for appliances which require high speed use like in camera flash and laser techniques. Capacitors are used to remove ripples by removing the peaks and filling in the valleys.